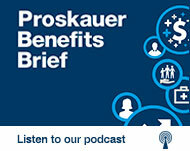 In this episode of the Proskauer Benefits Brief, Paul Hamburger, co-chair of Proskauer’s Employee Benefits & Executive Compensation Group, and associate Joe Clark discuss how the attorney-client privilege rules apply in an employee benefit plan context. The attorney-client privilege allows for the free flow of information between an attorney and a client in order to insure that the client gets the best possible representation. We discuss the various specific rules that apply in the employee benefit plan context where information is often shared between attorneys and plan fiduciaries. Joe Clark: Hello and welcome to the Proskauer Benefits Brief. I’m Joe Clark, an Associate in Proskauer’s Employee Benefits and Compensation Group and on today’s episode I’m joined by Paul Hamburger, co-chair of our Employee Benefits and Executive Compensation Group. In this podcast we will discuss some of the interesting and unique issues that apply when one considers how the attorney-client privilege rules apply in an employee benefit plan context. Paul, to get us started, maybe you can simply state the rule and what is the attorney-client privilege. Paul Hamburger: Sure. Everyone that is involved in legal issues has certainly heard of something called the attorney-client privilege. It’s helpful to really break down that definition for its key terms. It requires a communication that is made between privileged persons, that is made in confidence and that is made for the purpose of obtaining or providing legal assistance for a client. The purpose of the attorney-client privilege is to allow for the free flow of information between an attorney and a client in order to insure that the client gets the best possible representation, and representation that is in the clients’ interests. The key to understanding a lot of the issues that we’re going to be talking about today is to understand that the privilege, the attorney-client privilege, belongs to the client not the lawyer. Joe Clark: Are there other legal doctrines that potentially apply to protect the release of sensitive client information? Paul Hamburger: Yes actually there are some other doctrines. The general notion of attorney-client privilege of course is to protect the confidentiality of information between the attorney and the client but there are other doctrines. The most typical one that arises is in the context of litigation. There is something called the work product doctrine. That generally protects documents and other kinds of communications that are prepared in anticipation of litigation. Generally that information can be protected unless the information is otherwise discoverable in litigation and there is a substantial need for that information that can’t be obtained by any means other than having that information disclosed to the other party. You still get to protect any legal theories or legal opinions or conclusions or mental impressions of the case but it does provide some significant protection for sensitive information. Joe Clark: So that all seems pretty straightforward and basic. What’s unique about applying these rules in the context of employee benefit plans? Paul Hamburger: When we talk about applying attorney-client privilege in employee benefit plan context, we have to bear in mind that benefit plans usually involve three key parties. There’s the plan sponsor or typically the employer, there is a plan fiduciary or plan administrator and then the third category consists of plan participants and beneficiaries. Now a plan sponsor or the employer is involved in design decisions, whether to have a plan, not to have a plan or what provisions that plan will have, etc. So they maintain a separate set of interests from the participants. Plan fiduciaries though are different. Plan fiduciaries have to act for the sole and exclusive benefit of participants and beneficiaries. Because of that relationship between the fiduciaries and participants the case law under ERISA has developed a theory known as the fiduciary exception to attorney-client privilege. Under the so-called exception, advice provided to fiduciaries from lawyers has to be turned over to participants if they want or if they need it in any particular proceeding. The key here is to understand that the fiduciary, who is the recipient of the legal advice, isn’t really the client. When a fiduciary has to act for participants the ultimate client here is the participant. The fiduciary’s acting solely for the interest of the participant. So the key here is that while we call it a fiduciary exception, it’s not really an exception; what it is, is a way to identify who the client is that holds the privilege and in this case the advice went to the fiduciary but the fiduciary’s a look-through vehicle to the participant. Joe Clark: How is this exception applied in the multiemployer plan context? Paul Hamburger: With multiemployer plans, the application of these rules can be pretty tricky. The reason is that the lines are much less clear as to when a multiemployer plan trustee is acting as the plan’s sponsor or a plan fiduciary, for example. So you really have to look at multiemployer plan situations very carefully and consult with an attorney, hopefully on a privileged basis, to understand those distinctions in order to plan out the way in which communications will be made. Joe Clark: So as you describe it the exception appears quite broad. What are the limits to the exception? Can a fiduciary have a lawyer and keep the lawyer’s advice confidential and not subject to disclosure? Paul Hamburger: Yes, lawyers are obviously allowed to represent fiduciaries and the information that flows to fiduciaries ought to be able to be confidential. Where it gets tricky is to identify when that fiduciary is acting in its own right as opposed to representing the interest of the participants. So here’s some key points to remember. When the advice relates to a settlor or a function, a design decision, that advice can generally be subject to attorney-client privilege. Where the goal of the advice is related to the fiduciary’s personal liability that information can be maintained on a confidential basis as a general matter, where the advice relates to matters where the participant is clearly adverse to the fiduciaries. So for example in a benefit claims situation where the administrative record is closed, that’s where it’s much more likely when those interests are adverse that you can find the fiduciary having its own lawyer and its own attorney-client privilege distinct from the duty it owes to the participant. The key here though is that you have to make sure that the interests of the participant and the fiduciary are clearly adverse. That’s why it is important to make sure the administrative record is closed. And as we were talking before there’s an interesting nuance here when you’re dealing with fiduciary breach claims. Joe Clark: Yeah. An example in addition to the benefit claim context would be when you have a participant bringing a claim on behalf of the plan. Once the lawsuit has been filed, you would think that the parties are clearly adverse and depending on the facts, advice given to the fiduciary may be privileged. Similarly if before a law suit is formally filed, if it’s very evident that a lawsuit is going to be filed and there’s sufficient adversity between the parties again depending on the facts, the communications made remains protected by the privilege. Sometimes there are other parties involved though. Take an example: What if the government is involved in an audit or an investigation, can it step into the shoes of the participants and obtain legal advice provided to the fiduciaries? Paul Hamburger: That’s a very common occurrence and the application of the attorney-client privilege can be very tricky in these instances. When you’re dealing with the Department of Labor, generally the Department of Labor steps into the shoes of participants. Of course it depends on the investigation, but that is a general rule. The IRS, on the other hand, is much less clearly stepping into the shoes of the participants and therefore that fiduciary exception might less likely be applied in that instance. Sometimes also parties will have separate counsel. So you’ll have separate counsel for the committee or administrator versus separate counsel for the sponsor. In that case, in order for those separate counsels to communicate, you might also need a common interest or joint defense agreement. Joe Clark: Thanks, Paul for that clear and helpful summary of the attorney-client privilege. Obviously we all have a lot to consider and thanks to those of you who joined us today for this employee benefits podcast. Please join us for future presentations in our Proskauer Benefits Brief podcast series and keep an eye out for more employee benefits and executive compensation insights in our Proskauer ERISA practice center blog. Also, be sure to follow us on iTunes, Google Play and Spotify.